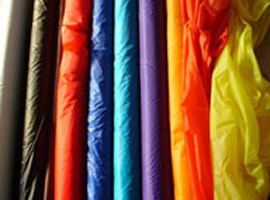 Our material is a 40 denier rip stop nylon. You can also buy it at the roll price of $4.60 USD (Roll price is for New Zealand customers only and does not include GST). Roll size may vary. Size of roll is usually between 100 and 200 meters. We may not have the colours you request in stock, so please enquire to the email bellow.